The 6 models of the M4i.44xx-x8 Express series are designed for the fast and high quality data acquisition. Each of the input channels has its own A/D converter and its own programmable input amplifier. This allows the recording of signals simultaneously on all channels with 14 bit or 16 bit resolution without any phase delay between them. The card uses only one A/D converter even when running with 500 MS/s, guaranteeing best signal quality without any interleaving technology. The extremely large on-board memory allows long time recording even with the highest sampling rates. In contrast to the parallel PCI buses PCI Express slots contain serial point to point connections. Each connection pair (lane) is able to reach a burst connection speed of 250 MB/s (Gen 1) or 500 MB/s (Gen2). 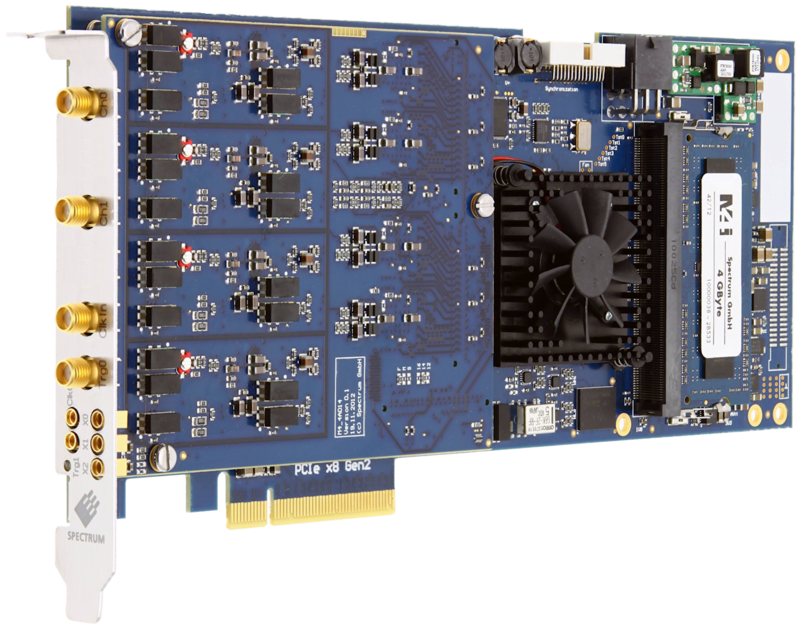 The fast streaming cards from Spectrum with PCI Express x8 Gen 2 interface need a physical connector of x8 or x16. The card interface can adopt to any electrical PCI Express interface, be it x1, x4, x8 or x16 with any PCI Express generation. One advantage of the PCI Express technology is the direct connection of each slot allowing a full transfer bandwidth for each single card. PCI Express is the bus standard for PC based systems for the next couple of years. Today's State-of-the-art motherboards normally have a couple of PCI Express slots but only one or two PCI-X slots. Server and industrial motherboards as well as high performance cosumer motherboards offer normally PCI Express x8 slots. The FIFO mode is designed for continuous data transfer between measurement board and PC memory or hard disk. The read (acquisition) transfer rate reached depends on the motherboard and can be up to 3.4 GByte/s on a PCI Express x8 Gen2 slot. The control of the data stream is done automatically by the driver on interrupt request. The complete installed on-board memory is used for buffer data, making the continuous streaming extremely reliable. The star-hub is an additional module allowing the phase stable synchronization of up to 8 boards in one system. Independent of the number of boards there is no phase delay between all channels. The star-hub distributes trigger and clock information between all boards. As a result all connected boards are running with the same clock and the same trigger. All trigger sources can be combined with OR allowing all channels of all cards to be trigger source at the same time. The star-hub is available as either piggy-back version (extending the width of the card) or as extension version (extending the length of the card to full length). The SDK option allows to directly transfer data between the Spectrum card and a NVIDA CUDA GPU card. The GPU card is optimized for parallel data processing. The package comes with a number of detailed examples like FFT or block average. 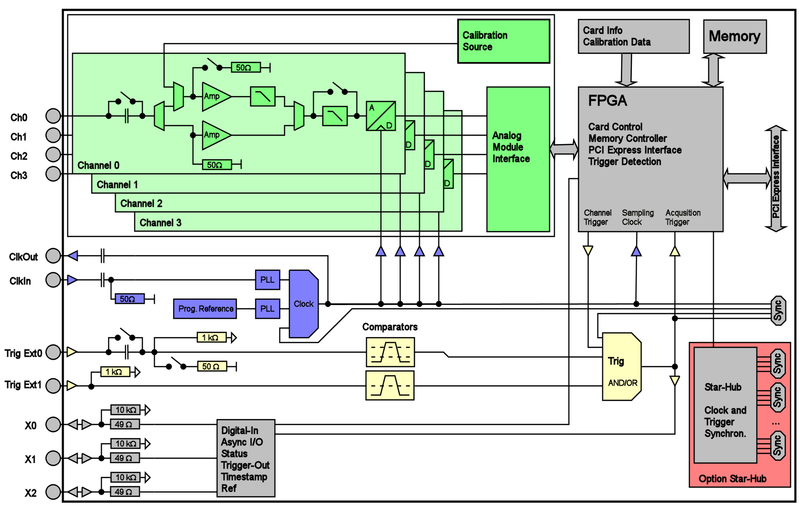 The card has two SMA connections for the analog channels, additional four SMA connections for trigger input/output and clock input/output and three MMCX connections for auxiliary signals like second trigger input or Multi Purpose lines.